We loved dyeing eggs in our house growing up. The alien-like features from the dye that was left on the whites of the hard-boiled eggs amazed me and I felt ashamed eating such interesting pieces of artwork!! 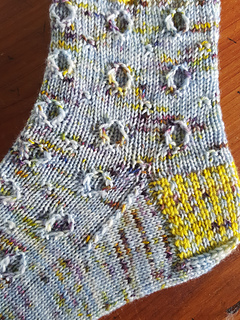 The motif of this sock is of an egg and when using variegated yarn, reminded me of speckled dragon eggs. The pattern is written using 9 inch circular needles but DPN and magic loop methods are given to get you started. 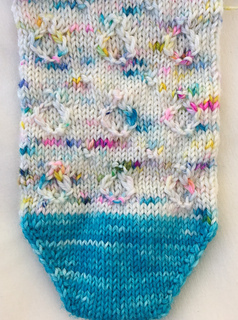 This is NOT a pattern for a beginning sock knitter. There are slipped stitches as well as twisted stitches with information for using a cable needle as well as doing these stitches WITHOUT a cable needle. Cake up your yarn and enjoy the process. 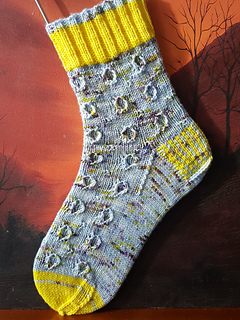 You might just have to wear these with shorts so you can show off your handiwork…these little eggs are just to fabulous to wear under pants! !